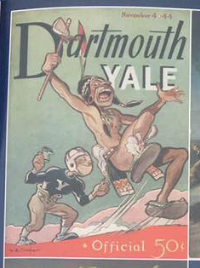 Another former Yale-Dartmouth football program cover. Once someone pointed out how offensive the images were, the Yale Athletic Department quickly issued an apology, the story said. Compare Yale’s response to the ongoing debate about art in the Minnesota State Capitol. Our state’s most important building also has images that are historically inaccurate of Native Americans and offensive to Native American communities. The state’s political leaders had a chance to do something about it this year as part of the Capitol renovation, but unfortunately the Art Subcommittee charged with review chose to minimize the issue rather than address it head on. 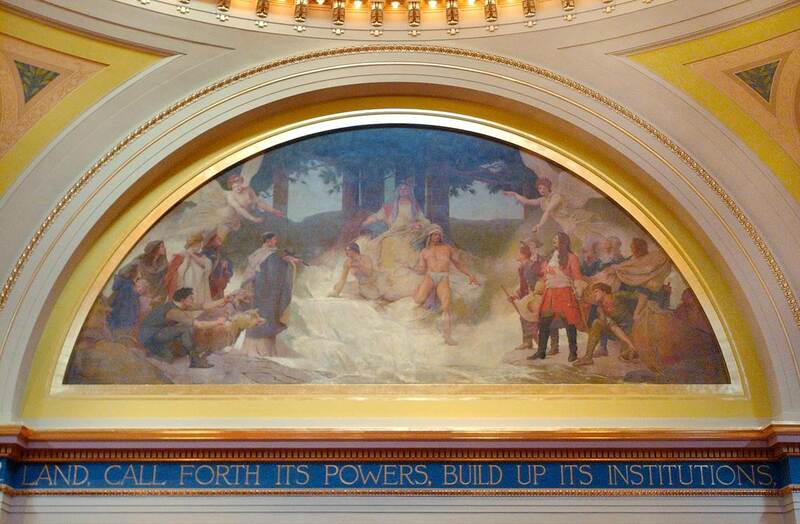 For example, here is one of the large murals in the Minnesota Senate Chambers, an image of a forced religious conversion of a Native American man and woman, with stereotyped images of them. 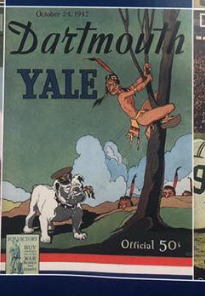 Like the Yale football program covers, the Native Americans in the mural above are shown (inaccurately) as half naked, the artist’s convention to show that they are uncivilized. While some Minnesotans have raised concerns regarding the fine art work within the House and Senate Chambers, the Subcommittee defers to those bodies to determine art content within legislative Chambers. Bottom line: The Subcommittee reports on public “concerns” about the art but doesn’t have the courage to take a stand of its own — stating whether it believes the art is offensive and racist or not. It was a fundamental question that sparked the art review to begin with and the Subcommittee failed to speak up. The report offers no recommendation about the art. It simply defers to the Senate. In this case, “defer” is a polite way of saying leaders ducked the issue.